Whether they came from a bag or straight from the fruit, you've probably tasted pumpkin seeds. 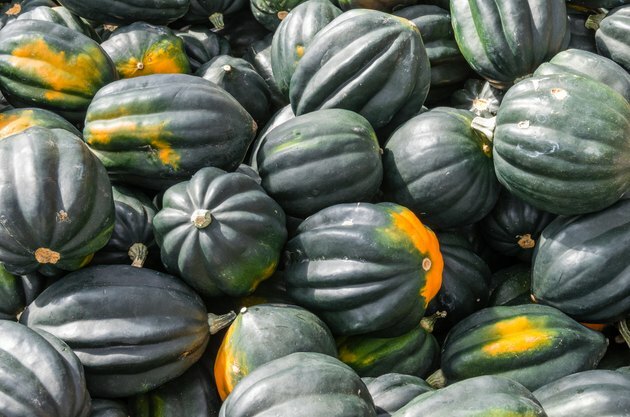 Pumpkins aren't the only winter squash that contain edible seeds; however, you can eat the seeds of virtually any squash variety, including acorn squash. Acorn squash seeds are nutritionally comparable to pumpkin seeds. They're packed with protein, heart-healthy unsaturated fatty acids and dietary fiber; whole squash seeds supply more than 5 grams of fiber per 1-ounce serving, according to the U.S. Department of Agriculture. The interior kernels are an excellent source of iron, magnesium, phosphorus, vitamin E and zinc. Like all squash seeds, the seeds in an acorn squash must be separated from the fruit's slimy guts before you can eat them. Rinse them clean in a colander, using your fingers to remove any clinging fibers. Spread the seeds out on a towel and allow them to dry thoroughly.